The newly released Post-Grant Patent Practice, 2nd Edition is an invaluable reference guiding patent professionals on all PTO post-issuance procedures. Written by four former Administrative Patent Judges of the PTO, this 880-page resource marks a turning point between the ebb of the first-to-invent system and the flow of the “first-inventor-to-file” system. This 2nd Edition is co-published with the American Intellectual Property Law Association, and significantly and thoroughly revises the 1st Edition based on the AIA’s U.S. Code sections, technical corrections, and final regulations. Also included is the PTAB interlocutory and final decisions issued since the 1st Edition was published. A significantly expanded discussion of AIA statutes and final regulations governing discovery, claim construction and amendment, real party in interest, joinder, and concurrent/multiple proceedings. Revised tables and appendices illustrating key provisions of all statutes and regulations governing post-grant practice. 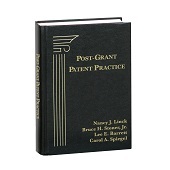 Post-Grant Patent Practice, 2nd Edition also adds expanded coverage based on recent developments, including relevant federal court case law. You’ll also receive the PTO’s final regulations and the U.S. Code sections governing all post-grant practice — making this 2nd Edition a complete reference guide for patent practitioner and IP professionals. Nancy J. Linck formerly served as the Solicitor for the USPTO and as an Administrative Patent Judge on the Board of Patent Appeals and Interferences of the USPTO, currently the Patent Trial and Appeal Board. Judge Linck is now with the intellectual property law firm of Rothwell, Figg, Ernst & Manbeck in Washington, DC. Bruce H. Stoner, Jr., a former Chief Administrative Patent Judge of the Board of Patent Appeals and Interferences of the USPTO, served as Chief Judge until his retirement from federal service when he joined Greenblum & Bernstein P.L.C. Judge Stoner serves as Chairman of G&B’s Reexamination and Post-Grant Review Group and as an expert witness and consultant on patent office practice and procedure. Carol A. Spiegel is a former Administrative Patent Judge on the Board of Patent Appeals and Interferences of the USPTO. Judge Spiegel is a Master at Giles Rich American Inn of Court and maintains membership in the American Bar Association, the American Intellectual Property Law Association, and the American Society for Clinical Pathology. Richard Torczon is Of Counsel in the Washington, D.C. office of Wilson Sonsoni Goodrich & Rosati, where he is a member of the patent litigation practice. Previously he was an Administrative Patent Judge at the Patent Trial and Appeal Board (PTAB), where he worked on patent interferences and appeals. During his tenure at the PTAB, he wrote more than a thousand opinions and orders on patent appeals, petitions, motions, and briefs. If you’re not completely satisfied with your order, simply return it within 30 days of receipt for a full refund.